We are here in the City of Lights in Western Australia! We keep having to pinch ourselves that it is all, at last, a reality. 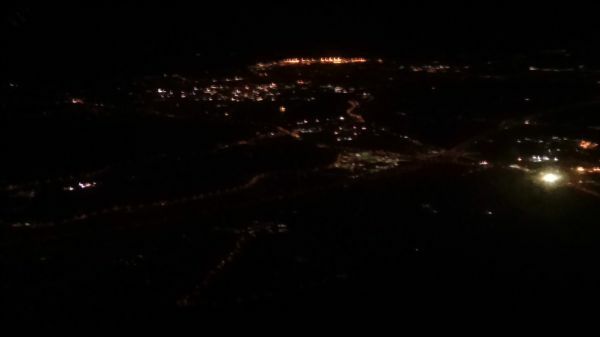 As we flew in, it looked like all the trees were lit up but I think it is just the regimented street lights. Now for the first of Jo’s Fascinating Facts for use at a variety of quizzes and dinner parties – I discovered that back in 1962 when John Glenn was making the first orbit of the earth the citizens of Perth switched additional lighting on which inspired him to give Perth the label “City of Lights”. 62 years later they repeated the big switch on when John Glenn returned to into space on a shuttle mission. Our journey was seamless from Heathrow via Dubai. But as is becoming the norm, we had a strange encounter at Heathrow. We were chatting over a coffee in Café Nero when this very smartly dressed man with a straw boater came up to us. He was in his 70s and he asked if he could have the two circular corrugated cardboard cup holders that were on our coffee cups. I said he could but I needed to know first what they were for, thinking that he was on some sort of recycling crusade. He said he couldn’t tell me until he had three so off he went in search of another one. Once he had a set of three and the interest of about three or four tables of people, he put them over his hand and onto his wrist. He said that they keep his shirt cuffs clean. Just about then, his carer arrived to persuade him to head towards their departure gate. He was obviously on a tour of European coffee shops gathering shirt cuffs. Each to their own. After a comfortable 6 hour flight to Dubai and a 10 hour less comfortable one (due to about 3 hours of turbulence for which even the crew had to strap in), we arrived in Perth at about 1am. 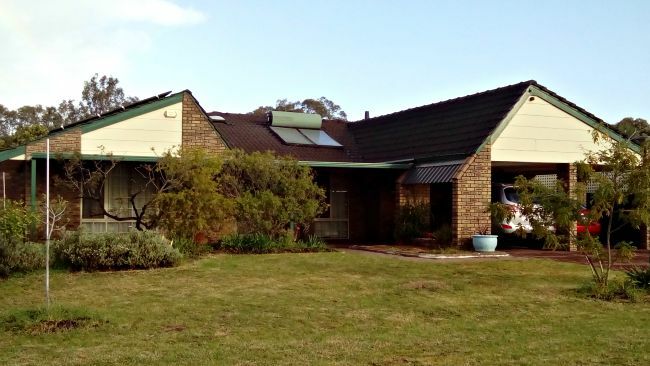 Our first hosts in Australia are the Ho family (Belinda, KQ and their daughter Marilyn – don’t ask about the initials because we haven’t found out yet – I think he may be in MI5). Despite email contact we always get that 30 seconds of doubt when we think, “What if they don’t meet us?”. After a couple of texts, KQ arrived full of smiles and good cheer and drove us to the family home in Wilson just to the south east of the city. After a bit of a lay in and late breakfast, we headed for the food shop. Strangely it was a Woolworth’s food store in the middle of Westfield Carousel. Westfield was branded the same way as the ones in the UK and was full of many of the same shops. Lidl and Aldi have not made it to Australia just yet, so it was Woolworth’s and adjusting to dollars which seemed very strange after Euros for so long. The next day, suitably rested and armed with maps and transport guides we headed to the bus stop. 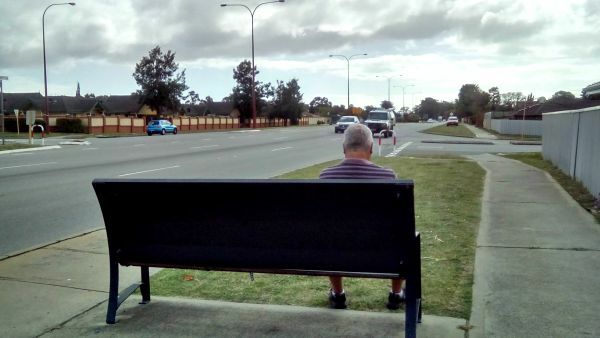 It was just a lonely bench on the side of the highway which oddly faced the traffic. Maybe it is so you can make rude signs drivers as they go by or maybe they can just look at us and say, “Sad losers with no car!”. It was about 40 minutes to the centre but we stayed on until the end of line which is near Barrack Jetty. The Jetty was purpose built in 1905-7 to cope with the increased influx of people and trade resulting from the Western Australia gold boom in the 1890s. 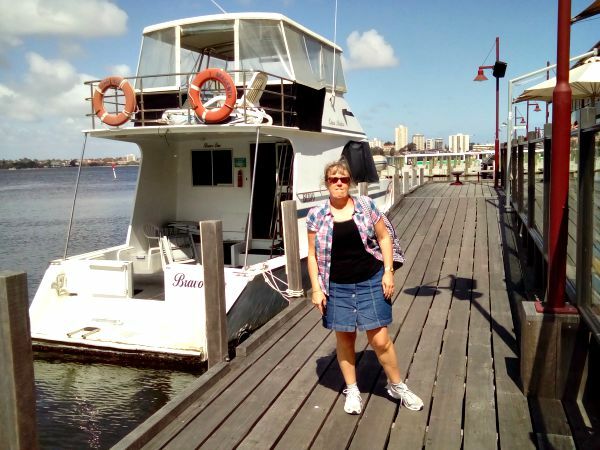 Today it is a the jetty for a lot of the ferry trips across the Swan River and to Freemantle. 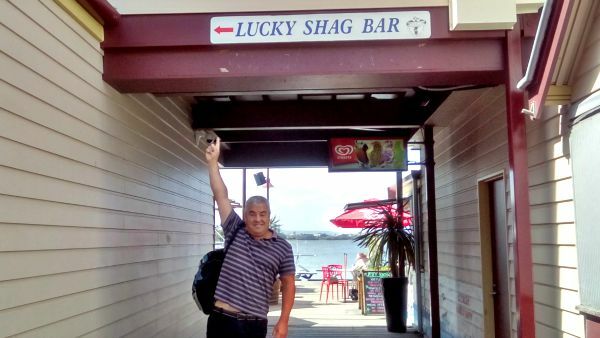 We found a very interestingly named bar…………. As a result of the tourist and commuter passengers, a lot of eating places and bars have sprung up around the jetty and it looks like more are under construction. The more wealthy residents can even park their boats alongside. 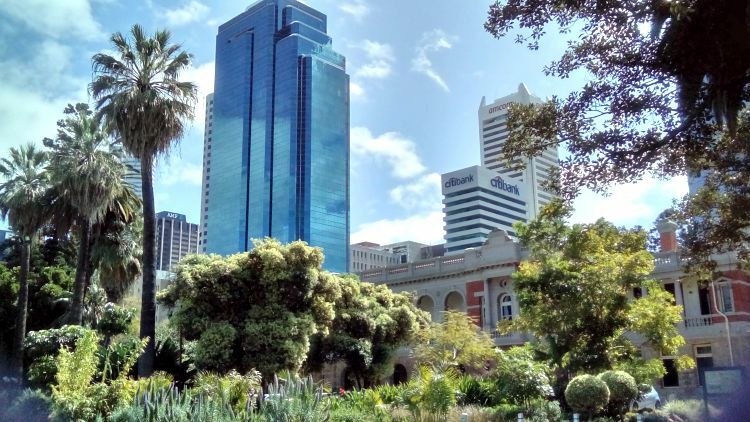 From the jetty we walked across Stirling Gardens, the oldest public gardens in the city, to admire the Old Court House which is the oldest building in Perth. 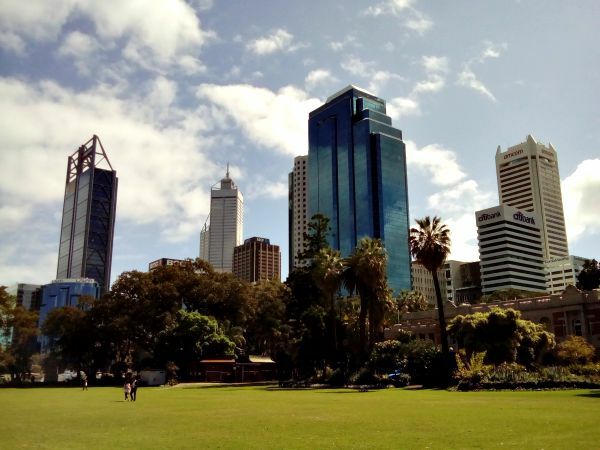 This view definitely gave us the mix of colonial Perth and the more recent architecture. After consulting one of the many maps we headed off along the esplanade which runs for around 2 km along the river bank. Again, there is a lot of development going on. It looked like more jetties to stop off at to eat, drink and relax. Shame – we were 6 months too early for these! We continued on over a causeway to Heirisson Island and the Nature Reserve. The Island was named after a French midshipman who was one of the crew on a scientific expedition that used long-boats to explore and plot the first maps of the area in 1801. 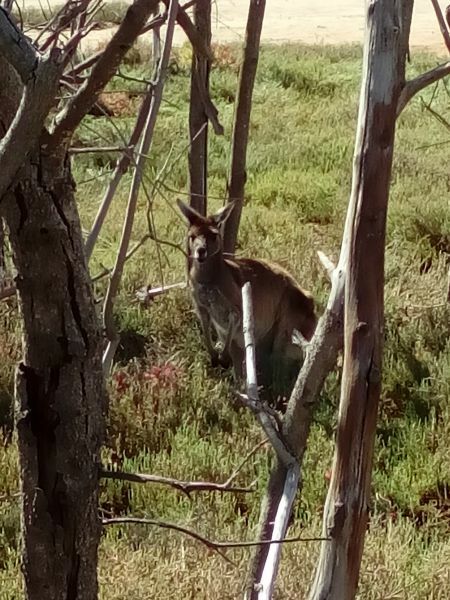 We saw our first kangaroos in the nature reserve. Despite the warning signs to say that they can be aggressive they were very timid. On the way out of the Nature Reserve there was a statue to of Yagan with the plaque saying he was an indigenous native warrior who died tragically in 1833. This was crying out to be added to Jo’s Fascinating Facts so I noted the name and have duly done my thing. Initially he and his people, the Noongar, befriended and worked well with the early settlers to Australia but after some land disputes the Noongar people started to oppose British settlement in the Swan River area. Following the death of one of his family members by white settlers, he led a series of robberies during which white settlers were killed. The government offered a bounty for his capture dead or alive. He was subsequently found and shot. Then it gets a bit macabre (to our shame). After his shooting, settlers removed Yagan’s head and it was sent to London. It was held in storage for more than a century before being buried in a unmarked grave in Liverpool in 1964. After prolonged appeals from the Noongar, his head was located and exhumed in 1993 and finally had a ceremonial burial in 2010 back in the Swan River area. 177 years after his death. 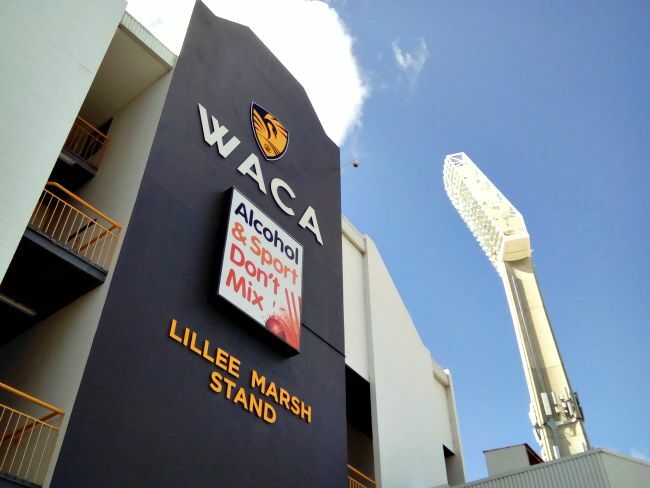 Our final stop off on our first trip to the city was to the WACA Stadium. Jon was like a kid (or more like a kid should I say!) It is the home of Australian cricket and is regarded as the quickest and bounciest pitch in the world. It has also been used for baseball, athletics, rock concerts and even the strangest of sports Aussie Rules (football). I will leave it to Jon to explain in full in his next blog. It looked like a load of beach boys running a lot, kicking a lot at four goal posts on a massive oval pitch. Jon even ended up watching West Coast Eagles (Perth) vs Hawthorns (Hobart) on the television with KQ to try and learn a few more rules. Hope this first post from down under is not too long. Just super excited about being here and can’t stop typing. Jon’s turn next and I am sure it will be more concise. He was definitely not a full pack Pete. Interesting meeting him though. Hope you’re enjoying the blog? So jealous that you got to visit the WACA! Would love to go there to watch a cricket match. Shame the Aussies aren’t as good on an English wicket! They can’t hack it on a grey afternoon in Nottingham. Looks like you’ve crammed loads in already, it must be so surreal! Hope we can fit in a Whatsapp call soon so Katie and I can hear all about the places you’ve seen. Love you both and missing you! Wouldn’t it be great to watch a game together at the WACA? Hoping to do a stadium tour at the end of the week if we can fit it in. Need to be careful what you say now as they’ve just won the one-dayers. I love the fact that you have found Kanga although it is a slight shame that Christopher Robin is pointing at a sign with the word “shag” on it. Christopher Robin felt that the “s” word was outweighed by the “Lucky” and “Bar”. It was a very blustery day but “fun, fun, fun, fun, fun” and as for the pooh sticks – don’t ask! Sorry I missed you too Emma. First on the list next time which should be some stage next March (sounds like so long doesn’t it?). Never fear – a return visit to the LSB is planned on the last day in Perth. Jon is disguising the visit as a chance to learn the ins and outs of Aussie Rules but just in case he disgraces himself we fly off to Cairns that evening. Cracking blog Jo. It’s like reading Bill Bryson! The big question though is how or why are these bizarre individuals drawn to you? It has to be Jon. As you say, Jon must be a regular bizarre individual magnet. Doesn’t say a lot for me but I will let you get away with that just this once. Glad you liked the post – I do get carried away with my history a bit so the danger signs serve as a good distraction and so far we have survived each experience. May not be so easy to avoid the wildlife on the barrier reef but at least there should be a responsible wildlife expert with us. Unlike our last two jaunts into the unknown! !